這些圖像是來自 ESO Top 100 Images的前10名：. ^ Welcome to ALMA!. [2011-05-25]. ^ The World's Biggest Eye on the Sky. [2011-05-25]. ^ Past ESO Directors General. [2011-04-29]. ^ Adriaan Blaauw. ESO's Early History. ESO. 1991: 4. ^ Lodewijk Woltjer. Europe's Quest for the Universe. EDP Sciences. 2006. ^ Adriaan Blaauw. ESO's Early History. ESO. 1991. ^ Adriaan Blaauw. ESO's Early History. ESO. 1991: 7. ^ Adriaan Blaauw. ESO's Early History. ESO. 1991: 8. ^ Adriaan Blaauw. ESO's Early History. ESO. 1991: 169, 179. ^ The best observing sites on Earth. [2011-05-13]. ^ The E-ELT project. [2011-04-29]. ^ E-ELT Site Chosen. ESO. 26 April 2010 [2011-04-29]. ^ ESO at a glance. [2011-05-05]. ^ Telescopes and Instrumentation. [2011-04-29]. ^ Astronomers Find First Earth-like Planet in Habitable Zone. ESO. 25 April 2007 [2011-04-28]. 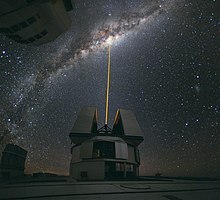 ^ The ESO 3.6m Telescope. [2011-05-05]. ^ HARPS: The Planet Hunter. [2011-05-05]. ^ WFI—Wide Field Imager. [2011-04-29]. ^ GROND Takes Off. ESO. 6 July 2007 [2011-04-29]. ^ National and Project Telescopes. [2011-04-29]. ^ Extrasolar Planet in Double Star System Discovered from La Silla. ESO. 24 November 1998 [2011-04-29]. ^ The Danish Telescope at La Silla. [2011-04-29]. ^ Rapid Eye Mount. [2011-04-29]. ^ TAROT website. [2011-05-04]. （原始内容存档于2011-08-30）. ^ Paranal Site Details. [2011-05-04]. ^ Telescopes and Instrumentation. [2011-05-04]. ^ A Giant of Astronomy and a Quantum of Solace. ESO. 25 March 2008 [2011-05-04]. ^ IMDB—Quantum of Solace (2008). [2011-05-04]. ^ The Very Large Telescope. [2011-05-04]. ^ ESO Science Library. [2011-05-04]. ^ Beta Pictoris planet finally imaged?. ESO. 21 November 2008 [2011-05-04]. ^ Unprecedented 16-Year Long Study Tracks Stars Orbiting Milky Way Black Hole. ESO. 10 December 2008 [2011-05-04]. ^ NASA's Swift Catches Farthest Ever Gamma-Ray Burst. NASA. 19 September 2008 [2011-05-04]. ^ VLT Unit Telescopes Named at Paranal Inauguration. ESO. 6 March 1999 [2011-05-04]. ^ Names of VLT Unit Telescopes. [2011-05-04]. ^ On the Meaning of "YEPUN". [2011-05-04]. ^ UK's VISTA website. [2011-05-04]. ^ VISTA: Pioneering New Survey Telescope Starts Work. ESO. 11 December 2009 [2011-05-04]. ^ First stunning images captured by VISTA Telescope. STFC. 11 December 2009 [2011-05-04]. （原始内容存档于2011年3月8日）. ^ Orion in a New Light. ESO. 10 February 2010 [2011-05-04]. ^ VISTA Stares Deeply into the Blue Lagoon. ESO. 5 January 2011 [2011-05-04]. ^ The ESO Survey Telescopes. [2011-05-04]. ^ VLT Survey Telescope Center at Naples Web Portal. [2011-05-04]. （原始内容存档于2007-03-05）. ^ ALMA Site - ALMA Science Portal. [2011-05-04]. ^ ALMA Science—ALMA Science Portal. [2011-05-04]. ^ Call for Proposals—ALMA Science Portal. [2011-05-04]. （原始内容存档于2011-11-14）. ^ ALMA Early Science Cycle 0 Call for Proposals. NRAO. [2011-05-04]. ^ Yes, it is the Image of an Exoplanet. ESO. 30 April 2005 [2011-05-04]. ^ Bad Astronomy, FIRST EXOPLANET IMAGE CONFIRMED!. [2011-05-05]. ^ It's Far, It's Small, It's Cool: It's an Icy Exoplanet!. ESO. 25 January 2006 [2011-05-04]. ^ How Old is the Universe?. ESO. 7 February 2001 [2011-04-05]. ^ ESO Very Old Stars. [2011-05-05]. ^ How Old is the Milky Way?. ESO. 17 August 2004 [2011-04-05]. ^ Surfing a Black Hole. ESO. 16 October 2002 [2011-04-05]. ^ Messages from the Abyss. ESO. 29 October 2003 [2011-04-05]. ^ Unprecedented 16-Year Long Study Tracks Stars Orbiting Milky Way Black Hole. ESO. 12 October 2008 [2011-04-05]. ^ A Supermassive Black Hole in a Nearby Galaxy. ESO. 8 March 2001 [2011-04-05]. ^ Feeding the Monster. ESO. 17 October 2005 [2011-04-05]. ^ The Most Distant Object Yet Discovered in the Universe. ESO. 28 April 2009 [2011-04-05]. ^ Witnessing the Flash from a Black Hole's Cannibal Act. ESO. 14 December 2005 [2011-04-05]. ^ GCN CIRCULAR, GRB 100814A: Submm observations from APEX, NASA email message.